Among some of the people mentioned in the record as having been present at the first Fourth of July celebration here are those of Mr. and Mrs. John A. Chadwick. of a superior quality which he will sell at prices to suit the times. for fronts of buildings, always on hand and sold very low for cash. warrant to stand the frost, or the money will, in all cases, be refunded. or at the City Treasurer's office near the Post Office. COMMON COUNCIL NOTE: The Grievance Committee to whom was referred the petition of D. S. Chadwick, praying to be released from his liabilities to the City of Watertown as Treasurer for the year 1857 and the year 1858, beg leave to report that after giving the same a careful consideration, think it the wisest policy for the Council to release him upon conditions hereinafter named. That is, 50,000 well burned brick, to be delivered to the City or their authorized Agent upon the first day of June, 1863, and 50,000, same kind of brick, upon the first day of June, 1864. This week we are called upon to record the death of one of the very earliest settlers of Watertown, John A. Chadwick, the sad event taking place at his home in the Third ward, Tuesday afternoon, May 8, 1888, in the 78th year of his age. Yesterday morning he arose in his usual good health and after breakfast he went out to do some work. While thus engaged, at about eleven o’clock he received a paralytic stroke and lingered until 3:25 o’clock P.M., when his spirit took its flight to the world beyond. With one exception, that of John W. Cole, Mr. Chadwick was the oldest settler here, coming to Watertown, March 12, 1837. Mr. Chadwick journeyed from Beloit to this place on foot, following the bank of Rock River. At this time Janesville and Beloit had each one house. Mr. Chadwick arrived at Fort Atkinson a few days after Dwight Foster and wife had settled there, and he stopped over night with this hospitable pioneer couple. 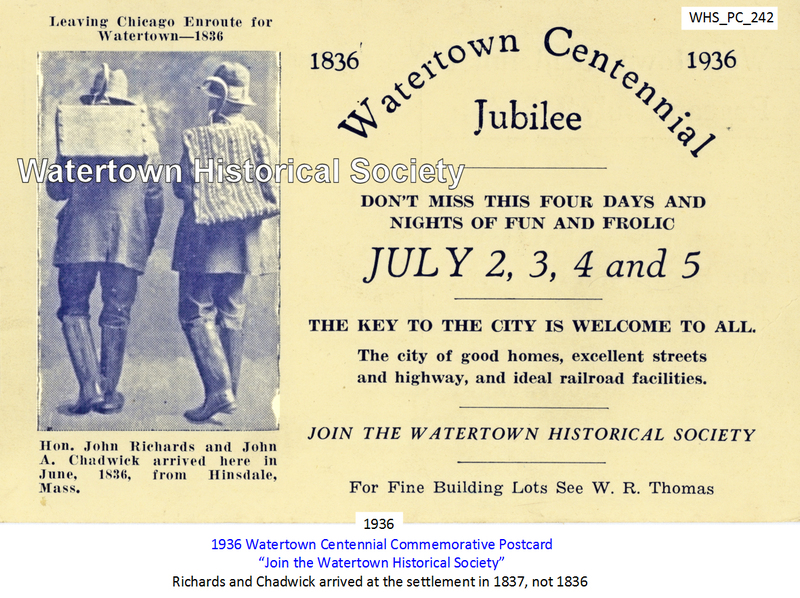 In 1842 Mr. Chadwick married Jane M. Johnson, daughter of the first white settler of Watertown, the late Timothy Johnson, who with one son, Allen H., of Minneapolis, Minn., and Miss Mary E. and Miss Nettie A., both residing at home survives him. Deceased taught school here somewhere between 1838 and 1840, and could lay claim to being the first teacher in Watertown. Mr. Chadwick claimed to have been the first to start a brick yard here in 1847, Andrew Willard, now living at Beaver Dam, being the molder. He had been connected with Watertown Lodge F. & A.M. for 37 years, and at the time of his death was its oldest member. Mr. Chadwick was born at Bradford, Vermont, November, 1810. He was a man of unblemished reputation, upright in all his dealings, and a fine type of the old pioneer now so rapidly passing from our midst. During his residence here of many years he had always been met with the kindliest of feeling in recognition of his warm, friendly attachments for those with whom he came in contact, and his memory will be long cherished by a wide circle of acquaintances. In their affliction his family has the warm sympathy of the entire community and may they find consolation in the knowledge of his pure and unselfish life. The announcement of the death of Mrs. Jane M. Chadwick last Friday was a shock and a surprise to our people. Few of whom knew of her illness, which was only a few days' duration. About a week previous she was taken with a severe cold, which later developed into acute bronchitis, resulting fatally at 8:30 Friday morning. She was in her 71st year. Mrs. Chadwick was widely known in this vicinity as the earliest living resident of Watertown. She was a daughter of Timothy Johnson, the first white man in Watertown, who settled here with his family in December, 1836, and founded the village of Johnston's Rapids. His daughter Jane was then 9 years old. This sparse settlement soon began to grow and Mrs. Chadwick has watched its development as each succeeding step was taken. Her reminiscences of embryo Watertown were of great interest and have often been recounted by her at old settlers' meetings and occasions of a like nature. Richards and Chadwick arrive at the settlement.